If you have a wired flow meter or Rachio Wireless Flow Meter enabled on your Rachio controller, your flow meter's settings will determine how sensitive it is to changes in flow, as well as when you are notified of leaks. To set up your flow meter properly, you must calibrate your zones from within the app. Whether you're using a Rachio Wireless Flow Meter or a wired flow meter, calibration is an important part of your flow meter's initial setup. 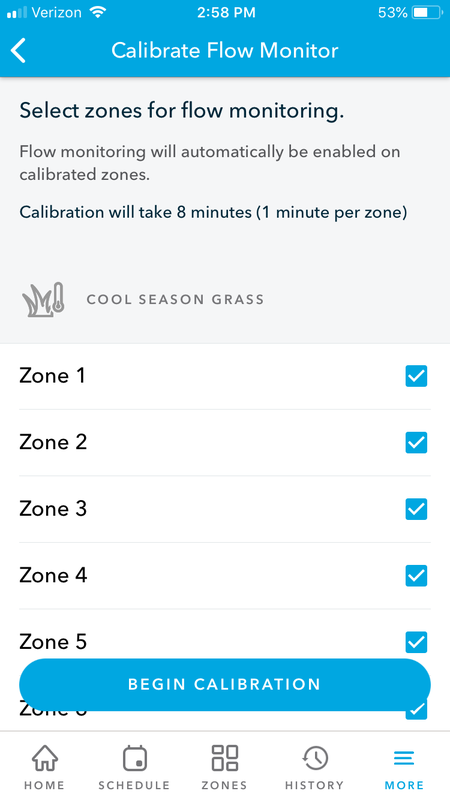 The calibration tool within the Rachio app runs tests your zones' flow rates in order to establish baselines for comparing your actual flow rates. These baselines are an essential piece of the flow meter puzzle, so don’t delay in calibrating your zones! For your flow meter to accurately report flow monitoring and leak detection, it must be calibrated with your zones. Without calibration, your current meter will not function normally or provide the readings that make flow meters so useful. 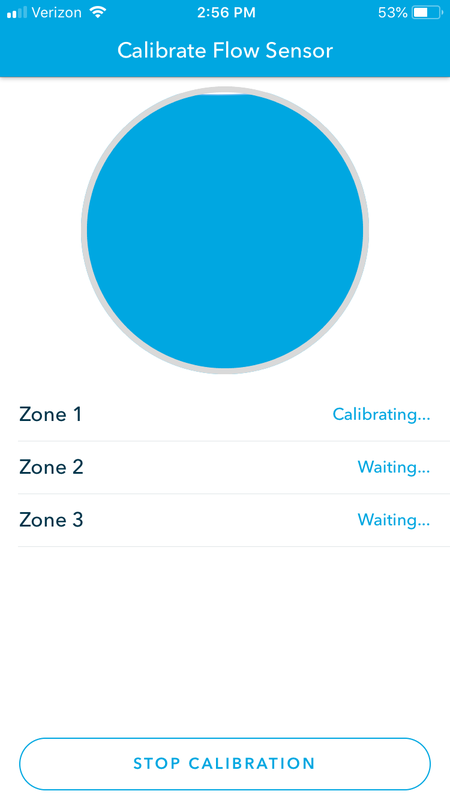 During calibration, the Rachio app will walk you through your zones individually and run each zone for up to one minute. This test run will read your flow rate to establish a baseline - the average flow rate that helps determine if there is a flow anomaly, such as a high flow leak or low flow. Running the zone for one minute ensures flow rates have stabilized before a baseline is measured, giving you greater accuracy. Make your selection. If you are calibrating a Rachio Wireless Flow Meter, select that option. 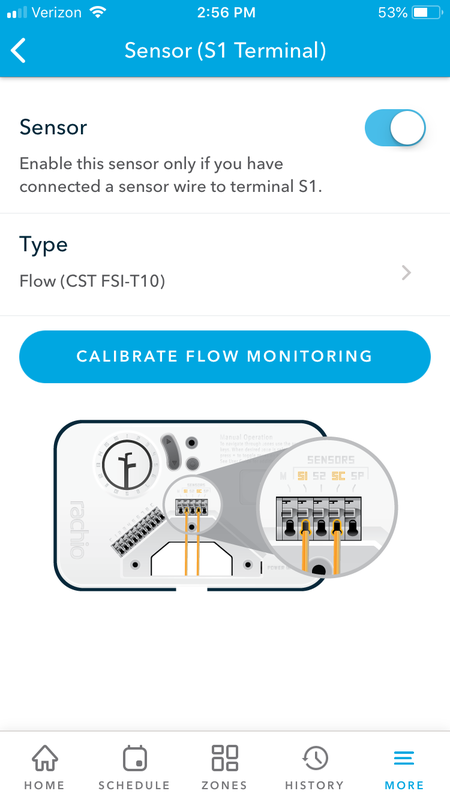 If calibrating a wired flow meter, select "Flow sensor"
Tap "Calibrate" (or "Calibrate Flow Monitoring") and then follow the instructions within the calibrate tool of the app. Select which zones you would like to monitor for flow and leak detection. Each zone will take approximately 1-2 minutes each to calibrate. Need to re-calibrate you zones? No problem! Just follow the same steps above. Your flow meter thresholds will default to 50% for low flow and 115% for high flow. This means if your flow rate dips to 50% or less or your baseline flow rate, or rises above 115% of your baseline flow rate, you’ll be notified of a flow anomaly and suggestions for followup. For more information on flow notifications, go here. Auto Shut Off disables a zone if high flow (often a high flow leak) is detected. This feature is enabled automatically after successfully calibrating all zones. To confirm Auto Shut Off is enabled on a particular zone, select the “Zones” tab in the Rachio app, then tap the applicable zone. Tap “Edit” and then “Flow Settings”. From here, toggle "Auto Shut Off" on. Select "Flow settings" and follow the prompts in the app.